Monica Lewinsky walked out of an interview in Israel after she was asked about her relationship with Bill Clinton. Ms Lewinsky explained on Twitter that she had walked off after she was asked about the "off-limits" topic. Israeli news outlet Channel 2 News thanked Ms Lewinsky and said it respected her "sensitivity". The former White House intern has said her affair with Mr Clinton was a "gross abuse of power" on his part. Ms Lewinsky had been giving a speech in Jerusalem on the perils and positives of the internet and social media. 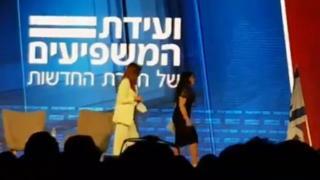 She calmly walked out of the gathering after Channel 2 News anchor Yonit Levi asked her about the affair. In a 2017 Vanity Fair essay, she said the case had led to her being diagnosed with PTSD after she was "publicly outed and ostracised" in the press, online and in court. But she said the interview in Jerusalem was supposed to be a "conversation to follow up on the subject of my speech, not a news interview" in a statement on Twitter. Channel 2 News said that it had sought to honour Ms Lewinsky's requests. It said it felt that "the question asked was legitimate, worthy and respectful, and in no way went beyond Ms Lewinsky's requests".